Includes all the information a savvy fundraiser needs! The 5th edition is completely updated with new stories and samples, the latest IRS rules and regulations, and social networking and crowdfunding guidance. Since the days when fairy tales were first told, people have been looking for a way to spin straw into gold. Unfortunately, this impulse remains alive in too many of today’s nonprofits. With sources of new money hard to come by and old revenue streams threatening to dry up—not to mention staff members and volunteers overextending themselves to do the basic work of the organization—the fundraising office is often expected to perform feats of magic, sometimes with few more resources than the legendary pile of straw. Don’t allow your organization to be trapped into this kind of fairy-tale thinking. Until your group understands that its success will depend, in large part, on your fundraising efforts—and is willing to invest in the people, resources, and technology necessary to do the job right—you’ll be spinning your wheels rather than spinning gold. And investing in fundraising should never mean investing only in activities that will produce immediate results: A successful fundraising program must also budget for the long term, with plans for such things as donor recruitment, cultivation, stewardship, and acknowledgment. These activities may not yield the immediate payback that writing a grant proposal would, but they will provide a solid foundation for the rest of your fundraising structure. This chapter introduces the tools you’ll need to create and execute a successful fundraising effort. The way you use these resources will depend on your group’s size and experience, but most groups, no matter how large or small, use some combination of these basic tools to raise money. equipment and technology for fundraising, including computer and Web tools. 501(c)(3) tax-exempt status and any required state tax permits. In addition, most states require you to register with their attorney generals before soliciting funds within those states (even via the Internet! ), and many states also require you to report on your fundraising expenditures and revenues. For step-by-step instructions on incorporating your nonprofit and applying for tax-exempt status, see How to Form a Nonprofit Corporation (national and California versions), by Anthony Mancuso (Nolo). 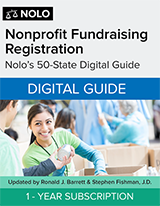 Then check out Nonprofit Fundraising Registration: The 50-State Guide, by Ronald J. Barrett and Stephen Fishman, J.D. (Nolo). In an ideal situation, your well-recognized and highly successful nonprofit would have a bustling staff of paid fundraising professionals, each with separate responsibilities and areas of expertise. More likely, however, you’ll need to cobble together a mix of as many board members and other committed volunteers as you can recruit to the fundraising cause, hopefully with the assistance of one or more paid fundraising staffers. The roles and functions of various fundraising positions are covered below, including how to involve and motivate your fundraising team. Don’t worry if your organization doesn’t have all of these people in place. Especially during a nonprofit’s early years, it’s common for several people to wear two or more hats—your best fundraiser may also serve as your volunteer coordinator, your executive director, or even the president of your board of directors. Track your own hours to find out your staffing needs. If you have the chance to expand your development staff, you’ll need to figure out what type of help will give you the most bang for your buck. The answer may be no further away than your own workday. Try keeping track of where each hour goes. Even quickly scribbling entries such as “9:30 to 11:00 planning meeting, 11:00 to 12:30 research” can reveal that you spend hours in ways you wouldn’t have guessed. If, for example, you find that most of your time is spent on events planning, it might be worth contracting with an outside events planner rather than putting a new person on salary. Or, if most of your hours go toward clerical tasks, you might save some money by hiring a support staffer. Fundraising is, or should be, part of every executive director’s (ED’s) job description. This includes getting to know the organization’s supporters, meeting individuals to solicit major gifts, interacting with staff at foundations, reviewing grant proposals, helping oversee special events, speaking at events, and more. Sounds like a lot of hours, doesn’t it? And most EDs already have plenty on their plates concerning their organizations’ missions, programs, and personnel. But any ED who doesn’t somehow make the time for fundraising activities isn’t fulfilling the job requirements, period. The smaller your organization’s staff, the more time your ED will need to spend on fundraising. But if your organization can afford to hire a development director, the ED might be tempted to delegate as many activities as possible to that person. This can be a mistake. To the outside world, the ED is the face of your organization, the person who (rightly or wrongly) is seen as having the fullest sense of how your organization’s need for money intersects with its mission, goals, and day-to-day work. Whether you are pursuing a large grant or trying to coax a major donor to increase support, the ED is usually the best staff person to close the deal. Fortunately, the ED won’t be solely responsible for all or even most parts of the fundraising process. The ED should help solicit major gifts, for example, but need not be present for every gift request. Nor will the ED have to be involved in the day-to-day work of staying in close contact with major donors. Your board and staff members may also participate, depending on who is being approached. And when it comes to grant applications, the ED’s role should be limited to reviewing proposals, not writing them. If you can afford a development director, grant writing and other behind-the-scenes tasks will be done by that person. If not, your organization may use board members and other volunteers, as well as paid consultants and freelance contractors, to do this day-to-day work. Ideally, a full-time development director’s role is to oversee all aspects of the fundraising process, including planning the fundraising strategy, gathering input from the board and ED, identifying potential funding sources, and ensuring smooth operation of fundraising activities. Typically, however, the development director’s role also includes carrying out practically every other aspect of the fundraising program: writing appeals, acknowledgment and stewardship correspondence, and grant proposals; meeting with donors to solicit gifts; posting on social media sites; coordinating events; and more. When this turns into busywork, it can prevent the development director from concentrating on important fundraising tasks. It will, therefore, be key to your group’s long-term success to identify other people who can help take care of discrete or routine tasks. —and often more fulfilling—process of building the nonprofit’s relationship with donors. Unfortunately, experienced and personable development directors are hard to find. There are more organizations seeking development directors than there are people up to the challenge, which means that the best can pick and choose. Those with an ounce of savvy won’t hitch their wagons to organizations that are teetering on the edge of financial collapse, dealing with internal dissension, or experiencing other serious problems. Less-established organizations often have to compromise by, for example, sharing a development director with another (noncompetitive) organization, hiring someone who isn’t fully qualified for the job, or hiring a part-time or assistant development director. Such a group usually gives the ED primary responsibility for fundraising. A little recognition goes a long way. Smart EDs and board leaders know that a dedicated and effective development director may easily burn out. One way to prevent this is to make fundraising a high priority and encourage all key people to participate without whining. Another is to recognize the development director’s hard work by thanking him or her, sincerely and in front of others, for jobs well done. Too often, recognition goes primarily to board members and volunteers, as if receiving a salary diminishes the value of the passion and energy the development director throws into a project. Don’t make this mistake! As a practical matter, a good board not only sets the direction of your programs, but will also be critical to the success of your fundraising efforts, both by making fundraising an organizational priority and by participating personally. To this end, it’s a big help to have someone on the board with a thorough understanding of nonprofit budgeting and finance. There’s little point in working hard to raise money if the board can’t make sure that the organization is meeting its financial obligations and spending wisely. You must be selective to find the ones with the knowledge and experience you need. You need to be upfront about your fundraising expectations. Most board members serve terms of only three years, with one or more renewals allowed. Check your bylaws—and think about amending them if your board members can serve “life terms,” and you’ve got a few who are running low on energy and ideas. (Or think about enforcing your bylaws if people are overstaying their prescribed welcome!) If your board members serve limited terms, you must build a process to incorporate new board members into the ongoing work of your organization. Why would anyone voluntarily commit many hours per month to a demanding position, usually on top of work, family, and other responsibilities? A few board members are truly selfless—they live to help others. Some are newly retired, with an adequate income and time on their hands. Most are hard-working people genuinely interested in the cause, who hope that they’ll be able to fit board responsibilities into their already-stretched schedules. Unfortunately, too many busy people turn out to be unrealistic in their hopes and end up unable to do much more than attend meetings (if that). Finally, there are the staff of corporate law and accounting firms and other companies that have a material interest in encouraging their employees to join boards. Even this category isn’t all bad, especially if you can make use of their professional skills (but realize that nonprofit finance and law are specialty areas that your average accountant or lawyer will know nothing about). No matter people’s motivations, many of them will have trouble making the kind of long-term commitment that active board membership entails. Some nonprofits are thus rethinking how their boards are structured, perhaps paring them down to ten or fewer members, but asking these members to farm out work—including some fundraising—to committees. The committees may be composed of nonboard volunteers who can commit to the occasional sprint of activity—say, a donor campaign or a special event—but not to the marathon of full board membership. Recruiting board members is a topic well covered in other places (see the resource list at the end of this section), so this book won’t go into detail. No matter what else they bring to the table, however, you must make sure that potential new board members have an interest in fundraising—and understand that this will be a substantial part of their role. Because there are so many ways to raise money, there’s a role for any willing board member to play. You can help by preparing materials that excite potential board members’ interest, such as a packet of items highlighting your organization’s mission, fundraising activities, and accomplishments. You should assemble a more extensive selection of such materials for purposes of training new board members. Some organizations give prospective board members a very clear up-front understanding of their fundraising responsibilities, by asking them to commit to making a major financial contribution every year. You might require board members to contribute a set amount or base contributions on a sliding scale. Asking board members for donations may seem odd—after all, they are already asked to give generously of their time, and now they’re being told they have to pay dearly for the privilege. One reason for this practice is that board members will be much better at soliciting large gifts from others if they can say that they’ve given themselves. It demonstrates their commitment to the cause and their confidence that the donation will be well spent. Perhaps more importantly by now, potential donors—individuals as well as foundations—have learned to ask, “How much have board members given?” You might literally lose out on a grant opportunity because the foundation was unimpressed by your level of board giving. For example, one environmental organization I know of not only specifically requires each board member to make a $10,000 donation as a condition of service, but also makes clear that each member’s primary role will be fundraising. When the organization needs advice concerning the technical parts of its mission or activities, it turns to a separate advisory council, made up of scientists and other experts. This organization believes that policymaking and fundraising are the major roles of the board. Their experienced staff and advisers, they feel, are in the best position to know how the organization should be run. While there’s merit to this approach, it also has a downside: If key staff members leave, or the organization faces another crisis or turning point, the board will not be well equipped to step in and provide continuity or plot a new course. Of course, your organization will need to decide for itself—based in part on what kind of work you’re doing and what community you serve—whether to solicit mostly affluent board members, or to ask for a particular monetary commitment. (For less-well-off board members, an alternative to the up-front donation might be to ask them to bring in an equivalent amount of money from a new donor or business.) For many community-based organizations or small advocacy groups, creating a financial requirement for entry could be just plain misguided. You might be lucky to have even a few affluent members. And the last thing you want is for representatives of a low-income community or dedicated former clients to be shut out. However, that doesn’t mean you can’t still ask a financially able board member to make a major gift. There is virtually no limit to what your board members can do to help raise funds for your organization—other than each member’s own interests and time constraints. Board members can help plan your fundraising program, spearhead or help carry out a special event, represent your organization in public, provide names of likely supporters, approach supporters for gifts, host house parties or other events, institute giving programs within their own workplaces, coordinate a new member drive, write personal letters, make phone calls thanking people for gifts, and much more. All of this will help take some weight off the shoulders of your in-house development staff. The wide variety of possible fundraising roles also allows board members who are reluctant to ask for major gifts to find a role behind the scenes. A well-run nonprofit will ask a great deal of board members, at the same time being sensitive to cries of “Enough!” Once board members become genuinely committed to your organization, they are more likely to stay interested and involved if you call on them for help on a regular basis. Performing minimal board activities—attending meetings and the occasional workshop, for example—can be less than soul satisfying. Ideally, you want board members to see that raising the money your group absolutely needs to do its good work can be the most rewarding part of board membership. Properly orchestrated, fundraising gets people out from behind the meeting table and into the community, where they can share what excites them about your organization. It also gives them a chance to enjoy the company of their fellow board members on a less formal basis, thus helping them form enduring friendships. The Truth About What Nonprofit Boards Want, by June J. Bradham (Wiley). What If the Board Just Won’t Fundraise? Make sure your board members understand and care about your organization’s mission. Some board members feel distant from the organization they serve. They may have joined the board for personal or career reasons rather than commitment to your cause. Will attending board meetings cure this? Not likely, if they consist of a superficial report by the ED and hours spent worrying about financial issues. But you can jazz up board meetings—for example, by bringing staff members to talk about what they’re currently doing. Do some “show and tell”—sample projects, art works by clients, videos, testimonials by local activists, or anything else that might rev up the board and get them to do something more than just sitting back and voting. Also try moving fundraising higher on the meeting agenda (it’s often left until the end). And serve food! Enlist an outside voice. Consultants are available to address a board meeting, lead a board retreat, and more. (Ask colleagues at other nonprofits to recommend a good one.) Or, you might arrange a webinar through Grassroots Fundraising Institute; see www.grassrootsfundraising.org. A nonprofit isn’t required to have an advisory council (or board or committee), but there are many good reasons to establish one. Such a group’s responsibilities include little more than—as the name suggests—offering advice and input on what the nonprofit is or should be doing. Members might be experts in a certain field, represent a community you’d like information from, be well known, or be past staff or board members whose experience you don’t want to lose—but who aren’t able to commit to board membership. For fundraising purposes, your advisory council can be a source of additional friends. At a minimum, members’ names should be added to your mailing lists. Their quasi-ceremonial role makes them particularly well suited to special events—you might call on them to buy seats, sell tickets to their friends, greet arriving guests, make speeches or presentations, and more. As the advisory council members develop an increased sense of connection to your organization, you may be able to solicit them for major gifts. And you should, of course, find out about their other experience and interests; they may be willing to put in some short-term volunteer time on fundraising activities. When it comes to the famous folk, your expectations of their actual participation should be minimal. You might be content for them to lend nothing more than their name, so that it appears anyplace that you list people associated with the organization—perhaps on your letterhead, website, newsletter, and in other publications. Your cause gains credibility, and the person named enhances his or her reputation by appearing to be caring and compassionate. If such people actually show up for your meetings, it’s a bonus. Although there’s always pressure to run a lean development office (so as to minimize the percentage of the organization’s money spent on fundraising), penny-pinching isn’t always a good thing. If your potential donor pool is large enough, you may actually become more efficient at raising money by hiring more people. If you are able to bring on help, you’ll need to confront the pleasant problem of figuring how to divide development responsibilities among a small staff. A first priority is usually to hire a “development assistant,” someone to handle the mail, enter names and other information on supporters into your database, check emails, prepare and mail thank-you letters, and handle other day-to-day tasks. Obviously, these chores could also be handled by a dedicated volunteer or another clerical person in your office, but the person will need sufficient oversight to make sure that the tasks get done on time and that the paperwork doesn’t get jumbled with other matters unrelated to fundraising. If you don’t have someone who will handle these tasks promptly and well, then you’ll inevitably discover, while you’re busy racing toward a grant deadline or staging an event, that important details have fallen through the cracks. The hazards of letting these matters slide are dealt with in other chapters—for example, Chapter 5 discusses how quickly you can lose a supporter’s loyalty if the thank-you letter is sent out late. A midsize organization may be able to afford a three-person department, adding a “development associate” to the mix. This is typically someone at a junior professional level, who works side by side with the development director, handling similar but less critical tasks. The associate would also have less responsibility for fundraising planning and dealing with key donors, and would be presumed to be “in training” for a director role. Larger organizations often split fundraising tasks into subject areas, assigning a development officer to each. For example, care and feeding of major donors might be assigned to one person, while another handles grant proposals. A few nonprofits, such as universities, have development officers who spend much of their time just researching funding prospects. A truly successful fundraising office will always be in close communication with and able to call on program staff as needed. For starters, you want program people to keep your office informed about what they’re doing, supplying you with interesting stories (with photos, if possible) to illustrate the important work donors are funding. a Guatemalan who’d watched his entire village massacred by the army only to have an unsympathetic immigration judge deny his case because conditions had supposedly “improved” in Guatemala. Because all of these stories so graphically illustrated the important work our group was doing, they were good material to communicate to potential donors—but not all of them saw the light of day. Unfortunately, because few nonprofits foster communication between program and fundraising staff, program staff members don’t even recognize their crucial role in the fundraising process. They may resent being asked to weigh down their schedules or dirty their hands with the business of fundraising. If this is your situation, try gentle persuasion rather than a frustrated lecture. Take a few key staff members to lunch, ask them about what they’re doing, and find out what fascinates—or frustrates—them about their work. This information will give you a fuller sense of what your organization does beyond its mission statement, and what challenges it faces day to day. Don’t finish dessert without explaining how you communicate with key donors and funders who are likely to give more if they understand why your group’s current work is so important. Between needing content for its fundraising appeals, website, email updates, and several bloggers, Share Our Strength and its No Kid Hungry Campaign are, well, hungry for regular information from program staff. How else will its communicators find out about things like the volunteer who drives around in a non-air-conditioned truck to deliver summer meals to hungry children, or the mother who declared that, thanks to the Cooking Matters class, she could triple the value of her WIC check? Opening the channels of communication wasn’t something that happened by accident, however. As Jason Wilson, Director of Digital Communications explains, “We’ve deliberately created a culture of storytelling within our organization. This involved bringing in three new people who focus on storytelling—called the Impact Communications Team—as well as identifying key stakeholders throughout the organization who are also responsible for sharing stories. We ask everyone to set aside time to find the stories that represent the impact we’re having, and then to connect with the Impact Communications Team, who are putting this information together for the Web or other materials. “We’ve seen the effect of this storytelling culture, and the more that people began to see their stories presented—the more perhaps in an email campaign or as online content—the more they realized the double satisfaction in not only accomplishing something through their day-to-day work, but also through the telling of that story. When you later use information a staffer gave you, be sure to show the staffer the appeal letter, or tell him or her about your successful meeting with a supporter or foundation officer. Some development professionals distribute brief emails or memos to staff describing recent fundraising efforts and successes, or post the classic thermometer to show progress toward a fundraising goal. Though you can do most of this casually and quickly, it’s got a name—internal marketing. And it’s a valuable tool for getting people within your organization to see how, by working closely with you, they can benefit through increased funding and recognition for their work. Your next step may be to request something more systematic from staff members. For example, you could ask program staff to write up regular reports on their activities or to simply stop by and let you know whenever something interesting happens. Asking program staff members to take photographs or videos of their work is also a great way to get them involved. A nonprofit can always use photos to illustrate its social networking pages, website, newsletters, brochures, and annual reports. A program staffer who is doing fieldwork—for example, visiting a project in the Maldives or taking children on a hike to see native wildflowers—should always bring a camera. Even in-house program staff consulting with clients over a desk should be encouraged to snap a few shots (with the client’s permission of course), in order to put a face to your work. Go light on the disaster shots. Although evocative photos of grieving family members and emaciated victims are undoubtedly moving and can be of some use in fundraising, more upbeat pictures showing your successes are usually even more effective. For example, a photo of the new buds of a nearly extinct flower that your group helped preserve will be far more powerful than a photo of the cracked cement that previously covered its habitat. If your organization holds staff meetings, make sure all development staff attend. If you’re a development staffperson, this will give you a chance not only to keep abreast of what’s happening, but also to give a regular report on the fundraising office’s activities. Such reports should include more than dry numbers, but also convey your hopes, challenges, and disappointments. Staff meetings can also provide a convenient forum for holding a general fundraising training. Such trainings can cover basic issues like the importance of developing an extensive list of supporters, how staff can help contribute names, how they and their clients can help represent the organization on their Facebook pages or at special events or meetings with funders, and what your organization’s strategic plans are for the future, fundraising plans included. Also encourage brainstorming about fundraising. A staffer may have the next great idea for bringing in support. As program staff hopefully get more attuned to the symbiotic relation­ship between themselves and your fundraising staff, you’ll want to encourage the more charismatic ones to help you with occasional, specific fund­raising activities—for example, participating in an important presentation to a potential major supporter or a foundation or writing or editing a portion of a grant proposal. A staff member who works directly with clients or issues is often the most eloquent and credible person to explain your nonprofit’s work to the outside world. The development office is certainly one place where volunteers can be useful, whether for ongoing office support or for labor-intensive, one-time projects, such as mailings or telethons. No matter what role they play, however, they reduce your need to raise money to pay salaries. You can advertise volunteer opportunities in your written materials, work with local volunteer placement organizations, and check with local colleges and schools, some of which require students to perform community service as part of their curriculum. There are also numerous Web matching services, as detailed in “Get Help From Volunteer Matching Organizations,” below. Understand and respect people’s motives for volunteering. Train volunteers well and ask for a specific commitment. Make volunteering as convenient as possible. Find ways to allow volunteers to have fun. Show your appreciation early and often. Big businesses may offer their paid staff as volunteers. While they don’t get a tax deduction for these contributions, businesses do get goodwill, an opportunity for employee bonding, and an invest­ment in a more economically stable community. Your best bet is to approach businesses that are geographically near to your organization, especially ones whose goods or services your staff or clients might later purchase. Be ready to point out how, through your newsletter or other means, you’ll publicly recognize their businesses’ contributions. Most people who agree to volunteer for your organization will be drawn to your cause, intellectually or emotionally. They really care about fair housing, avoiding conflict through mediation, or giving inner-city kids a chance to develop their intellects by playing chess. But of equal importance to many volunteers is the chance to meet new people, develop skills, and feel needed. If a volunteer shows up full of energy and enthusiasm, and you ask that volunteer to photocopy stacks of reply cards for hours, you may never see him or her again. This can be a hard lesson to learn. After all, the photocopying is crying out to be done, and you don’t have the time to create work that will keep every new, inexperienced volunteer happy. But many organizations rely too heavily on their volunteers for thankless tasks, only to find that their volunteers don’t stick around for long. And, at a deeper level, being involved in a grassroots, community effort should allow you to make a little room for the community to participate meaningfully. Idealist, at www.idealist.org. Nonprofits can enter their own profile and post events and volunteer opportunities. Jesuit Volunteer Corps, at www.jesuitvolunteers.org. The JVC’s long-term volunteers, mostly recent college grads, accept one- or two-year placements where they can provide direct services to economically poor or socially marginalized people. (Your organization doesn’t have to be Catholic or religious to use JVC volunteers.) Your organization pays for screening and placement fees, food, a monthly stipend, daily transportation, housing, and medical insurance. Make a Difference Day, at www.makeadifferenceday.com This is an annual (October) event sponsored by USA today. Volunteers seek out projects for one-time work. Nonprofits as well as individuals can register project ideas. Taproot Foundation, at www.taprootfoundation.org. This organization’s pro bono project finds professional volunteers with expertise in information technology, marketing, design, finance, strategic planning, and human resources and places teams of them in nonprofits in major U.S. cities that have successfully gone through a service grant application process. Grant applications are reviewed quarterly. Volunteer Match, at www.volunteermatch.org. This site is one of the largest online networks of nonprofits recruiting volunteers. All for Good, at www.allforgood.org. Another major site for finding volunteers. If you’re a development staffer, some, much, or even all the work of recruiting volunteers may fall to you. This makes some sense—your mailings and publicity may ask for donations of time as well as money. You’ll soon realize that this is one of those tasks that can turn into a full-time job. If your organization really does plan to rely on volunteers in a big way, you might want to create the position of volunteer coordinator. Because foundations are always interested in leveraging their grant money into maximum results, you may be able to attract the financial support necessary to make this a paid position. Or, if you find a person with lots of energy, time, and savvy, you may find yourself in the happy position of having someone volunteer to be your volunteer coordinator. Fortunately, there are a number of relatively simple ways to satisfy volunteers’ needs and interests. Asking them at the outset what they’d like to get from their experience is a good way to start! But be prepared to talk with them individually (or to save time, in small groups) about what you can and can’t involve them in. Emphasize that volunteers are most likely to construct useful, fulfilling roles with the organization if they commit to sticking around long enough to allow you to help each of them find a good fit. Another great approach, if you have regular volunteers, is to try to schedule them so that they overlap and can talk with each other. Especially if your organization uses volunteers in nondevelopment roles, arrange for volunteers to split their time between the development office and other work, for variety’s sake. To help with development tasks, you might capitalize on the fact that some volunteers are primarily interested in learning high-level job skills—writing or marketing, for example—and might be interested in interning with your office for an extended time period. Also look at the tasks you might otherwise hire out, such as photography, illustration, or designing a newsletter or an annual report. Local business schools are likely sources for this kind of help. basic office policies, such as personal use of the phones and photocopiers. Unless you are recruiting the volunteer for a one-time effort, ask for a commitment to a certain number of hours per week or month. Be prepared to make this flexible, however. The number of people who work traditional 9-to-5 jobs is declining. Your best source of daytime volunteers may be freelancers who have spare time—but not always at the same time each week. Be ready to provide feedback on how your volunteers are doing: constructive criticism as well as positive reinforcement. Volunteers who are trying to develop job skills, or will eventually ask you to serve as a reference, need to know how they are really doing. Your feedback will be taken best if you tell the volunteer during the initial training that you’ll periodically sit down for a performance review—and if you make clear that the volunteer will then have a chance to give you feedback on the volunteer experience and what would make it better. If the very mechanics of volunteering for your office are difficult—for example, if the volunteer has to call someone on your staff who’s hard to reach—it creates another reason for the volunteer to drop the obligation. Let’s look at how a school literacy program in Oakland developed a volunteer program that’s convenient for all concerned. The program is in a public school, in an area with numerous senior care centers. Seniors and others are encouraged to spend one hour a week reading to schoolchildren. No experience is required. To participate, they simply call one of the volunteer coordinators and say they’ll be there that week. The coordinators prefer it if the volunteers can make a long-term commitment, but it’s not required. For weeks when the program is short on volunteers, it has a list of backup people to call. And, to make sure the program doesn’t become too much of a burden for any of the volunteer coordinators, each of them is in charge of managing one day a week. This literacy program has run smoothly—and succeeded in boosting the children’s interest in reading. It creates a system in which no one feels overwhelmed by the amount of work, and people with more or fewer hours to spend can commit accordingly. It also has the virtue that volunteers perform the same task every time, to reduce the amount of oversight needed. This won’t always be possible in your office, but it’s something to bear in mind. Do they really need to come into your office? Online volunteering is on the rise, by people who have just enough time to sit down at their computer. Take advantage of this trend, for example by posting online volunteering opportunities at national websites, such as www.volunteermatch.org or www.idealist.org. Once your organization starts thinking innovatively about what volunteers can do, you may find that your volunteers breathe new life into your programs—thereby attracting more attention from funders and supporters. Every volunteer wants to know that he or she is making a difference and advancing the cause. Especially when working with highly effective volunteers, it’s important to say thank you early and often. For example, I fondly remember volunteering for a school garden tour committee that hardly ever let me walk out empty-handed—I was given a school T-shirt, a pair of gardening gloves, a poster from last year’s tour, tomato seeds, and more. I was momentarily embarrassed by their generosity, but I got the message—they appreciated the help. And, most important from the school’s point of view, I kept going back to do more. Try also to plan some organized volunteer appreciation activities. An annual volunteer party, for example, is guaranteed to be well attended. Inviting volunteers to your nonprofit’s other events, such as a holiday party, a lecture, or an annual dinner, is also an excellent way to show your thanks. Don’t forget to take advantage of a well-attended occasion by giving a little speech about how much particular volunteers have done for your organization—which you can accompany with awards or certificates. To supplement your salaried development staff, it can be useful to hire consultants and contractors. Be warned, however—the hourly rates of well-established writers, designers, accountants, and others may dwarf your own salary. But independent contractors start to look more affordable when you realize that you don’t pay for their health insurance or office space, and you don’t have to find a way to pay their salaries year-round. You can assign them to a limited task and tightly control the hours they spend. Consultants and contractors are probably available in your area for just about every task a development office does, from grant writing to direct mailings to individual solicitations to leading board seminars or retreats. Ask other nonprofits for recommendations, or go to www.idealist.org, where you can post requests for volunteer consultants or search for and read profiles of consultants for hire. While outside workers can provide valuable expertise and take the pressure off when numerous deadlines loom, you’ll want to avoid three common problems. First, start by making sure you remain the “boss” in this relationship, and don’t end up unsuccessfully trying to manage an opinionated and balky consultant. Second, carefully define in advance exactly what the contractor will do on your behalf, when the job will be completed, and how much it will cost. Third, be sure that the services to be completed according to the contract are ethical, honest, and follow fundraising approaches with which you are comfortable. Can You Pitch Your Nonprofit in the Space of an Elevator Ride? You’ve probably heard of scandals where hired fundraisers go out and solicit money (by telephone, for example), then take a healthy chunk for their own salaries and “costs” before turning the remainder over to the nonprofit. Although the nonprofit isn’t directly at fault for depriving donors of money that doesn’t go where they thought it would, the nonprofit won’t emerge unscathed from any resulting negative publicity. In addition, some states’ laws address nonprofits’ use of professional fundraisers, for example, by requiring the fundraisers to disclose their status to the people being asked to donate. Whatever you do, don’t hire outside contractors on a commission basis—that is widely viewed as unethical and, in some states, is even illegal. Don’t inadvertently turn a contractor into an employee. If you treat contractors or consultants like employees (by requiring them to keep regular office hours and closely supervising them, for example), you’re headed for legal trouble. The IRS, as well as state tax and employment authorities, may claim that you should have paid the same taxes and benefits as you would for ordinary employees. For easy-to-access, free information about the legal differences between employees and contractors, see the independent contractor materials on Nolo’s website at www.nolo.com. For more detailed information, including a wide selection of sample contracts, see Working With Independent Contractors, by Stephen Fishman (Nolo). profiles of various people who have made a career of fundraising. You’ve probably heard the saying that “people give to people, not to causes.” While that may be a bit of an exaggeration, it contains an important message: A fundraiser’s ability to relate positively to his or her fellow human beings is crucial to that person’s long-term success. Unless your fundraising office has so many staffers that a few can sit in the back room and write grants all day, everyone should enjoy the idea of interacting with outsiders, be they donors, foundation funders, board members, or others. If you’re interviewing a prospective new development staffer, and the consensus is, “We’re not crazy about his personality, but he’s smart, writes well, and knows our work,” proceed with extreme caution. Your supporters and funders may have the same tepid reaction. Networking with other fundraisers is also an important part of this job. It’s worthwhile for development professionals to join national or local groups such as the Association of Fundraising Professionals (www.afpnet.org). The ability to write effectively plays an important role in nearly every aspect of fundraising, whether it’s drafting a thank-you letter, an email appeal, or a grant proposal. If you’re more of a people person, who would rather swallow frogs than devote a few days to a writing project, you’ll probably be very effective at some aspects of development work. However, if you hope to run a development office, you’ll need to learn some new skills. More on the jargon of giving. For a humorous deciphering of some of the most prevalent jargon found in the philanthropic world—terms like “at-risk,” “capacity building,” “empowerment,” and “leverage”—see Tony Proscio’s book, Bad Words for Good. Proscio will make you think twice about some of the words that may have been slipping off your tongue.